Is Eminem Hip-Hop’s Brightest Star? Clean and sober and grappling with adulthood at the tender age of 37, the biggest-selling artist of the millennium wants his spot back. As tourist attractions go, 19946 Dresden Street doesn’t look like much. A squat, brick-faced house on the east side of Detroit, its front yard is a rectangle of dry soil, flecked with trash and tufts of grass. At just past 11 on a sunny Tuesday morning, a woman in her late 20s named Sierra is standing on the front porch, scanning the street, holding her infant daughter on her hip. EXCLUSIVE PHOTOS: Go behind the scenes of Eminem’s SPIN shoot! “They come from all over,” Sierra says. “They take pictures, ask questions.” Several visitors have tried to buy the house — one offered $56,000, another $72,000 — but she likes it too much to consider selling. A neighbor once told her that, years ago, when the place was uninhabited, she broke in, found boxes full of the teenage Marshall Mathers’ stuff, and sold it on eBay. “I don’t know where she is now,” Sierra says, nodding toward the boarded-up house to the left of hers. “Those neighborhoods aren’t that far from where I live now,” Eminem says. It’s a few hours after my visit with Sierra, and the 37-year-old rapper and I are in the ultramodern recording studio in suburban Detroit where he’s finishing Recovery, his seventh album, much of which was recorded here on an enormous mixing board he bought from his mentor, Dr. Dre. His face lean, bordering on gaunt, Eminem sits in a leather rolling chair in a plain white T-shirt, dark, baggy jeans, and white Nike Air Max 92s, leaning forward with his hands folded. The last time he went by 19946 Dresden, he says, was a year and a half ago, and a side window was boarded up. “I didn’t know if there was a fire or what,” he says. “It looked like no one lived there.” It is hard, at least for strangers, to get Eminem to do something with his face other than stare impassively, but when I describe my visit, his eyes widen. “It’s still there?” he asks. In his stiff, alert bearing, there’s no hint of the manic playfulness you get in his music or his videos. This is especially striking because the studio, which he owns and refers to as “my house,” is a pleasure dome: A dozen vintage arcade games line one wall of the main lounge, facing a soda fountain. A pile of unopened shoeboxes — freebies sent by Nike — sits next to a window facing an interior garden equipped with a barbecue grill. Many successful people — not to mention virtually every rapper in history — say they thrive on struggle, even as they’re surrounded by opulence. But Eminem, the biggest recording artist of the 2000s, to the tune of 80 million albums sold, has a relationship to adversity that is unique and extreme. He made his name, foremost, as a fighter, as a threat, as an irritant — battling for acceptance as a white MC, railing against censorious parents’ groups and pundits, lashing out viciously against everyone from his mother to George W. Bush to ‘N Sync. Recovery is about that period in his life. Unfiltered and unrelenting, it’s the most emotionally grueling album Eminem has released, detailing his addiction, anxieties, and nightmares with barely any recourse to the schizoid character-juggling, gross-out humor, or splatter-film gore that have been his trademarks until now. 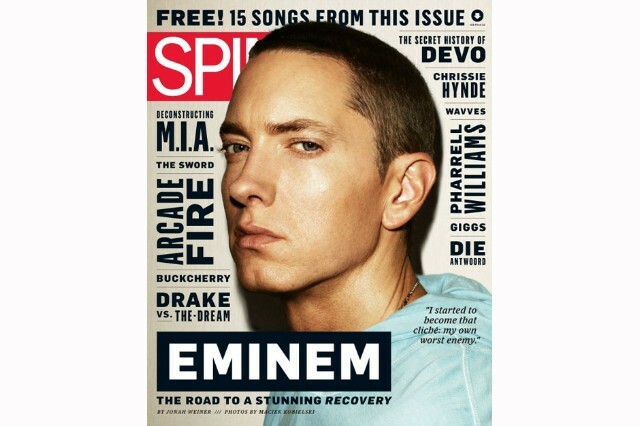 Like the car trips he likes to take through his old neighborhoods, reminding himself how bad things were, Recovery is an often harrowing trip down one blighted memory lane — the kind of street you don’t feel quite safe on, even at 11 A.M.
Read the full Eminem cover story in the August 2010 issue of SPIN, on newsstands now.